From Lauren: This recipe is created by Jean Choi, a fellow Nutritional Therapy Practitioner who regularly contributes grain-free recipes. When the warmer months hit, I crave the citrus baked goods because they are so refreshing and tart in the best way. I especially love lemons, and there’s something magical that happens when you add a bit of sweetness to them. The combination of flavors is just a match made in heaven that’s hard to resist. 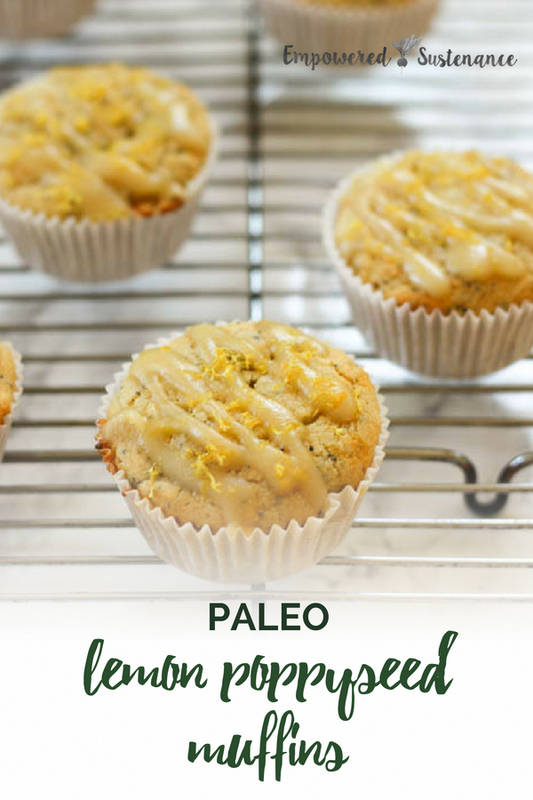 So, to celebrate spring, I made these Paleo Lemon Poppy Seed Muffins. They brighten up my mornings, especially when I’m busy and need a quick and easy breakfast. They are even more delicious slathered with some grass fed butter and alongside a cup of coffee. Don’t skip the coconut lemon glaze which intensifies the fresh lemon flavor. Cassava flour – Cassava flour is a type of flour that is grain free, gluten free, and nut free, and acts most similar to wheat flour which makes it great for gluten free baking. It’s available at Thrive Market here for the best price. Do not substitute with any other flour for this recipe. Poppy seeds – Poppy seeds have a nutty and slightly fruity flavor that pairs beautifully with lemons. You can leave them out if you don’t have them on hand but these muffins are so much better if you include them! 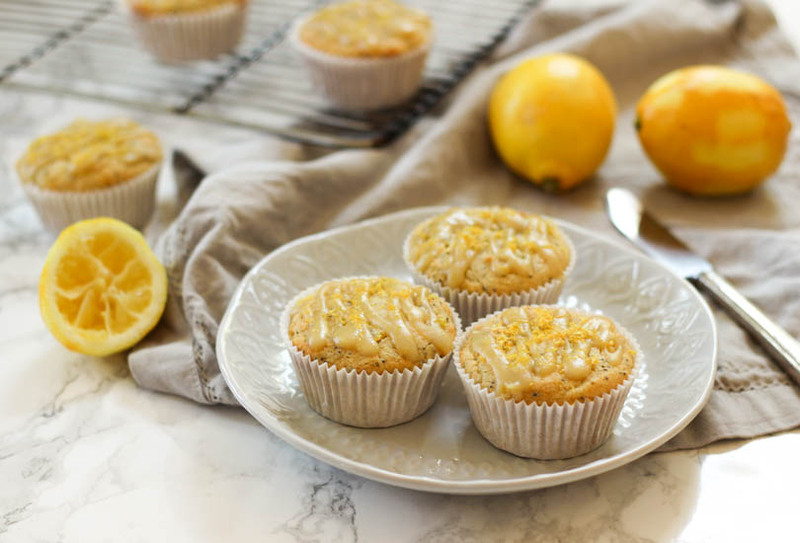 Lemon – Make sure to use fresh lemon juice for these muffins and choose organic lemons, if possible, especially since you’ll be using the zest for that lemony flavor. Line a 6-cup muffin tin with a muffin liner, or grease with coconut oil. In a large mixing bowl, combine cassava flour, poppy seeds, baking powder, baking soda, and sea salt, and mix well. In a separate bowl, combine maple syrup, coconut oil, coconut milk, lemon juice, egg, lemon zest, and vanilla extract. Whisk together. Pour wet ingredients into dry ingredients and stir together until just combined. Divide the batter into the muffin tin, filling each cup about ⅔ of the way up. Bake for 20-25 minutes, or until a toothpick inserted at the center of a muffin comes out clean. Cool for 5 minutes before removing the muffins from the tin. In a small saucepan, combine all ingredients and heat over low heat until fully melted and combined. Drizzle on top of the muffins. If you want, add more lemon zest on top of the glaze. Let it cool. The glaze will harden once fully cooled. The body is not a war zone. It would help out a lot if you would include the picture of the product on the printed recipe sheet. Most people would like to see what the finished product should look like. Hi Joyce. 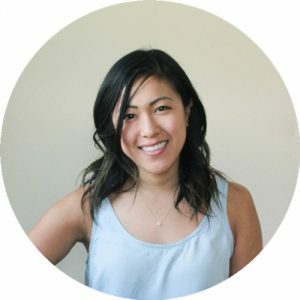 I appreciate your feedback and chose to offer a print option for only the written recipe, as it saves ink and paper. The photos of the finished recipes are on each blog post. I cant eat egg yolks. Can I just use the egg white for this recipe? I don’t know how that would work. I would recommend increasing the coconut oil by 1 Tbs. for every egg yolk you remove — if you try it, let me know how it works. I love in Australia and we cant buy that flour here. Can I swap it for something?